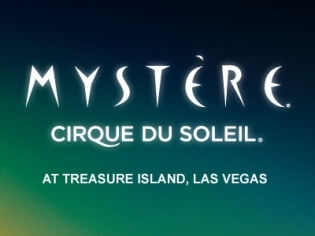 Described by the show’s director Franco Dragone as a celebration of the cycle of life, Mystere is the first Cirque Du Soleil show to grace Las Vegas Boulevard, making its debut in 1993. 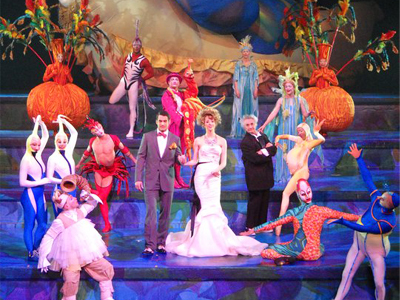 Mystère has been around Las Vegas longer than any of the other Cirque Du Soleil shows and continues to be a favorite among locals and tourists alike. The show is presented with a circus-like theme, but goes above and beyond by showcasing the talents of some of the most skilled acrobats, contortionists and dancers that you will ever see. 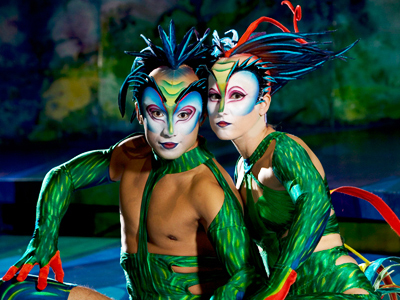 Mystère is a culmination of varying acts that seem to defy human capabilities. One of these acts, known as Aerial Cube, features a metal cube being juggled by a performer while he leaps through the air and performs a ballet. There are also comedic moments during the performance, such as one instance where a giant baby played by a fully grown man pouts and chases a large bouncing ball across the stage. There are many feats of strength, flexibility and coordination throughout Mystère’s performance to keep you fully engaged in the excitement. 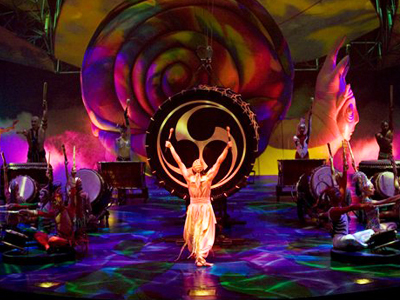 When you see this show for the first time, you immediately understand what makes it so well received and loved by those who have already witnessed the fantastic world of Mystère. First the negative: The clown sketches are sort of detached from the rest of the (actual) show. They make up for about a quarter of total stage time and are little more than increasingly annoying interruptions. – Minus one star out of five. Now the other 75% of the show: An unforgettably great experience of excellent (world class) athletes and artists making the hardest stunts look so easy as they are melting into a soulfully crafted dreamworld. Simply outstanding! Couldn’t imagine a greater show for anyone who loves acrobatics! It was my first Cirque show. I’m still gawking about how awesome this show is. Such great and beautiful costumes, someone should win an award. Great performers! We were very pleased with the show. We sat in the upper level which gave us a great view. The stunts are amazing to see. Would see it again. What a great show. Was really amazed by the performance. Best show we saw while in vegas. I think this is one of the best shows we have ever seen. This was an incredible show, it was VERY enjoyable. We plan on seeing this show again! The costumes were GREAT! 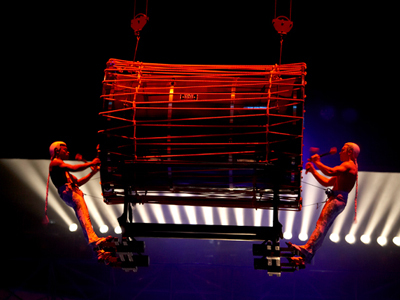 The Sheer strength and muscle on these performers are insane! Captivating and Breathtaking Acrobatics! The show was stunning! Don’t want to miss this show!!!! This was the first Cirque du Soleil I saw and was amazed! The acrobats were unbelievable, the pre-show clown hilarious. I recommend this show to everyone. One of the best if not the best cirque show going, go see it! Every aspect of this show was incredible! The performers were brilliant. The acts were amazing. The costumes were breathtaking! My favorite was the Red Bird!! He was awesome! The show kept us in a state of awe and laughter. Smaller theater than I imagined, which makes every seat great. This was our first trip to Vegas and thoroughly enjoyed this show. Highly recommend for the whole family. Astonishing acrobatics and belly laughing humor. 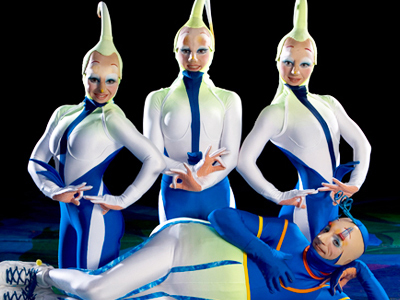 This was the first cirque show I had ever seen and I became a huge fan. It is the show I compare all cirque shows to and so far I still consider it the most impressive visually and the stunts are outstanding. If you are considering seeing it, I suggest you do! You won’t be disappointed……it is UNBELIEVABLE!!!! We loved it! We have seen other Cirque shows. (Ka & O). Mystere was just as good as the other Cirque shows , if not better.The acrobats are so talented and just amazing. The music was great too. The theater is just perfect for this show. Yet another great show! !